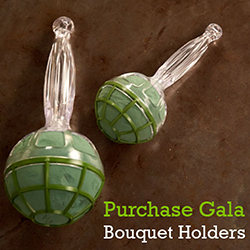 Protea Wine Bottle Vases! Presto Change-o! 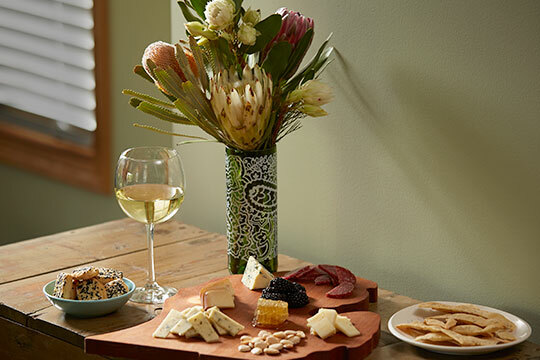 I love to whip up a meat and cheese board- and the perfect companion is wine. Wine bottles are an art unto themselves. In the Protea Episode of J Schwanke’s Life in Bloom- I turn this elegant bottle into a vase- to accompany my meat and cheese board. The Wine Company is Protea Wines… and they have several delicious wines to choose from- and the bottles are exceptionally beautiful. I love that the cord also says “Protea” on it… that’s pretty cool and a very nice touch! I love having flowers accompany EVERYTHING… and there’s no better way to accent a table – than with a vase of flowers- and how cool is it to have a vase that matches the bottle of wine you’re serving? Add to that- it’s Protea wine- and you fill the bottle with Protea Flowers… here we go!!! 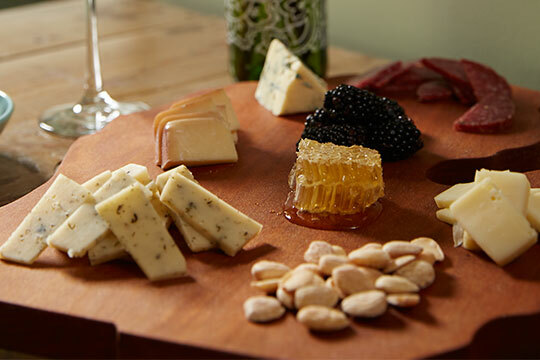 Featuring Cheese from the Cheese People of Grand Rapids and local honey and black berries. My cheese board is made in Michigan- and it’s the shape of the lower peninsula – remember it’s shaped like a mitten… (and we show at the end of every show… proudly stating that “J Schwanke’s Life in Bloom” is made in Grand Rapids Michigan)- for those of you following along on your hand… that’s about midway between the bottom of your little finger and your wrist…. hehehe! I get local cheese – from The Cheese People of Grand Rapids- they frequent the farmer’s markets we attend year round- that’s another Michigan thing- we don’t stop going to the Farmers Market- even when it’s well below zero- and the snow is flying… I love supporting our local farmers ALL YEAR LONG… back to the Cheese People- they have some incredible cheeses- including a Stinging Nettle Gouda- used in this Protea themed episode… I also have some wonderful local honey comb- and black berries… along with an Italian summer sausage. 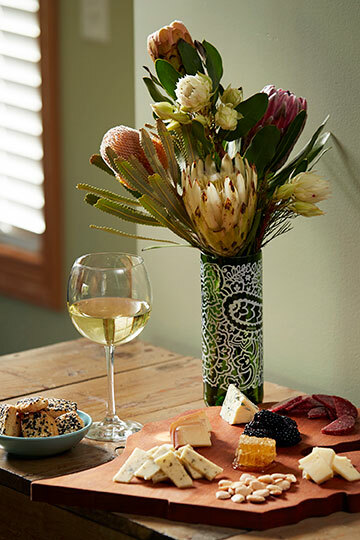 Re-purposing a Protea Wine Bottle into a vase to accompany the cheese tray! If you’re going to attempt a bottle yourself- use care and caution- Use protective Eye wear and I suggest gloves- but most of all… I suggest finding a friend that is skilled and is willing to help you out… Let the expert be the expert… especially when it comes to saw blades, glass and fire… I’m great at Arranging flowers- with my Swiss Army Knife… but glass bottle cutting not so much!